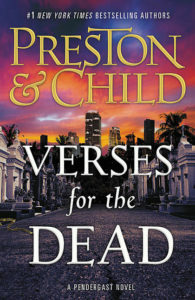 Preston and Child are back on track, returning to bizarre murder cases that require the unique mind and methods of FBI Special Agent A. X. L. Pendergast. It’s their best book in quite a while, as strange and twisty as you could want. For some time now Preston and Child’s excellent Pendergast character has been mired in affairs related to his convoluted–and often dangerous–family relationships. This time there was only the barest allusion to a difference in his relationship with his ward in the first chapter then it’s off to Miami and a grisly murder. The authors have also given a partner to the perpetual loner, with directions from on high that they must work together, not separately. The Pendergast mysteries always benefit from the addition of an outside point of view. Native American Coldmoon, as the junior partner on this case, does an excellent job providing this. I’m hoping that this partnership will extend beyond one book. At least that door was left open. The mystery itself is appropriately gory and bizarre, exactly what you expect in a Pendergast case. And, as usual, the agents are working against the clock, trying to limit the number of bodies a serial murderer leaves in his wake. It’s back to classic Pendergast. And that’s exactly what I’ve been missing. Pendergast’s boss is tired of the way this agent breaks the rules, even if he does always solve the crime. So he saddles Pendergast with a partner before sending him off to Miami. There a woman was brutally murdered, her heart removed and then placed with a note on the grave of a woman who committed suicide years ago. Then it happens again. For more about Preston and Child and their books, click here. This entry was posted on Thursday, January 31st, 2019 at 9:55 am	and is filed under Book Reviews. You can follow any responses to this entry through the RSS 2.0 feed. You can leave a response, or trackback from your own site.